In June 2002 Mick Jagger, the Rolling Stone who has long scandalized the world with his immoral lifestyle and appalling stage acts, received one of the highest honors Queen Elizabeth II can bestow: the knighthood. In the Middle Ages, the Catholic knighthood symbolized a second Baptism. The knight-aspirant used to spend the day before the ceremony in Church, where he confessed his sins to a priest, heard Mass, received Communion, and then remained alone all night before the altar to prepare his soul for the solemn act of his entrance into this more noble state of chivalry. On the day of his dubbing, he was dressed by attendants in a white robe meant to represent the cleanliness of his body and soul. Next came the red cloak, to indicate readiness to shed his blood for the Church and noble causes. His outer garment was black, to represent the death he must be ready to bravely face. His brown stockings symbolized the earth to which he would return at death. 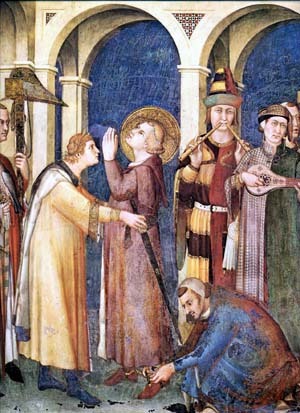 During the ceremony, he took a solemn vow according to the laws of chivalry: never to consent to lies or treason, to defend the Church, to succor the helpless and oppressed, to protect women, widows, and orphans, to go to Mass every day, to fast on Fridays in memory of Christ, to never retreat before the enemy, etc. (The French had 20 vows of Knighthood). He received a blow with the flat of a sword on his neck or shoulders, which signified the last insults he could receive without retaliating. "In the name of God, St. Michael and St. George, I make you a knight," was one of the popular formulas in England. His response: "So I shall be, with God's help." Despite the Revolution’s unflagging efforts to destroy the prestige of every aristocratic institution, something of the golden aura conferred by this magnificent institution blessed, and one could even say created, by the Catholic Church continues to cling to the ideal of knighthood. That is why this act of Queen Elizabeth II, the latest bad choice in a chain of bad choices, is all the more disturbing. Mick Jagger not only violates all the principles of chivalry, but blatantly mocks even the laws of basic decency. Allan Bloom singled out Jagger in the The Closing of the American Mind as the sine qua non of everything that was diseased in youth culture. In 1965, Paul McCartney and the other Beatles were honored by Queen Elizabeth with an MBE (Member of British Empire) medal. Afterward they confessed that they had smoked marijuana in the Buckingham Palace bathroom just before the ceremony. An act of frontal offense to the honor they would so shortly receive. The British people responded with shock and protest. Some former recipients of the honor even returned their medals to the Queen, saying they did not want to be in the same company with these scandalous rock stars, symbols of rebellion and drugs. The Beatles had already released their album glorifing psychedelic drugs, “Sgr. Pepper’s Lonely Hearts Club Band,” dedicated to known Satanist Aleister Crowley. One month after the album’s release, they once again shocked the world announcing publicly they were taking L.S.D. Thirty years later, in 1996, the Queen knighted Beatle Paul McCartney for his “contributions to British music and society.” No apolgies had been made or were offered then for the past life and actions of McCartney and the Beatles. Thus he was implicitly presented as a model to be followed. The glory of the chivalry of old was dragged into the mud. But more was to come. One year later British society received a new model to be followed: homosexuality. This took place in 1997 with the knighthood of homosexual “pop rocker” Elton John, who had once romped in a cemetery for an album cover and scandalized the world with his homosexual confessions. What would such “achievement” be? A list of his personal “achievements,” in a certain way, epitomize the whole counter-culture. Having fathered seven children by four different women, he was also rumored to have a fling with fellow rocker David Bowie. Jailed for the use of drugs, and vandalism, he revels in pushing the limits of human excess and degradation in onstage acts too vulgar to mention. The catalog of songs he has authored is famous for demeaning women, and glorifying violence and Satan. Rock music and drugs, sexual promiscuity and homosexuality, the occult and Satanism. With these knighthoods, Queen Elizabeth II implicitly gives citizenship to these themes. Although it is a slight deviation, let me make a more concrete and immediate observation for my readers. It is, of course, quite easy to criticize the Queen for “caving in” to modern culture and making knights of rock stars. But, in a certain way, the stimulus for her actions comes from the acceptance of this culture among the masses. And here, even many Catholics, unfortunate to say, promote the rock music of the Beatles and Rolling Stones by playing it in their homes or attending their concerts. One can object, “I don’t approve of their lifestyles, I just like the music.” But the music was the product of the lifestyle. Catholic parents who accept it are giving tacit approval to the cultural revolution and the “hard rock” they ask their children to reject. Doesn’t this acceptance, in fact, imply a kind of “baptism” of rock culture in a Catholic home? The bestowing of a knighthood on a degenerate individual like Mick Jagger exposes a tactic of the Revolution employed in both the spiritual and temporal orders. That is, when the Revolution cannot do away with a noble or aristocratic institution, it tries to debase it. In the case of the nobility, the title comes to mean less when it is shared with those who are not truly worthy of the honor. In fact, the word, honor (from the Latin honor: excellence of character, high moral worth) loses its meaning when applied to persons of poor character and bad morals. Titles were simply forbidden in the United States after the American Revolution (lthough it could not quash the American fascination with the titled nobility of Europe, which exists to this day). It was not so simple in France, where, after the French Revolution, the people still had a strong attachment to the aristocratic institutions. Since the people were clamoring for nobility, Napoleon took it upon himself to make a new one. In fact, the reality was not so far removed from Giordani’s comedy: Napoleon raised a good number of common soldiers to the ranks of general, duke, prince, and even king. “I made them from mud,” he boasted, speaking of his generals. Inflating the numbers of titles and honors, Napoleon demoralized the legitimate recipients and thus debased the titles. The revolutionary goal of leveling institutions triumphed under him – not by the guillotine or force, but with an intelligent maneuver. It is a maneuver that continues to be carried out in the social, political, and religious spheres right up until our day. This is why it is important to have an understanding of it, so that we can make analyses under its light. In the temporal sphere, Queen Elizabeth II bestows titles on rock stars like Paul McCartney and Mick Jagger. In the spiritual sphere, Pope John Paul II invites a rock icon like Bob Dylan himself to perform at a Eucharistic Congress, and makes an album with pop stars like Britney Spears. Do they realize how much actions like these serve the revolutionary cause? Who can say? But that is, by the way of the facts, what they are doing. Far from fighting the “culture of death” they give their tacit approval to elements that constitute it. 1. The Satanic links to both the Rolling Stones and the Beatles have been well documented. Up and Down with the Rolling Stones, a book written by Tony Sanchez, a personal friend of the band Tony Sanchez, connects Mick Jagger and others to the practice of black magic. In The Ultimate Evil, Maury Terry describes how the Satanic “Process Church” recruited the Rolling Stones and the Beatles. Michael Matt’s Gods of Wasteland (Remnant Press, 2000), also clearly shows the Satanic roots of rock and demonstrates that a Catholic cannot take a middle road on this topic. 2. A.S. Guimarães and M.T. Horvat, Previews of the New Papacy, (Los Angeles: TIA, 2001), pp. 94, 101.